From Craig – A lovely gift from our listener “ARKCigars”, these 7″ x 38 lanceros make a perfect addition to your art gallery or your humidor. The most beautiful twisted pigtail cap sit atop a flawless Ecuadorian Habano Light “Clario” [sic] wrapper. The binder is half Mexican San Andres and Nicaraguan Jalapa seco, all over confidential inner components. 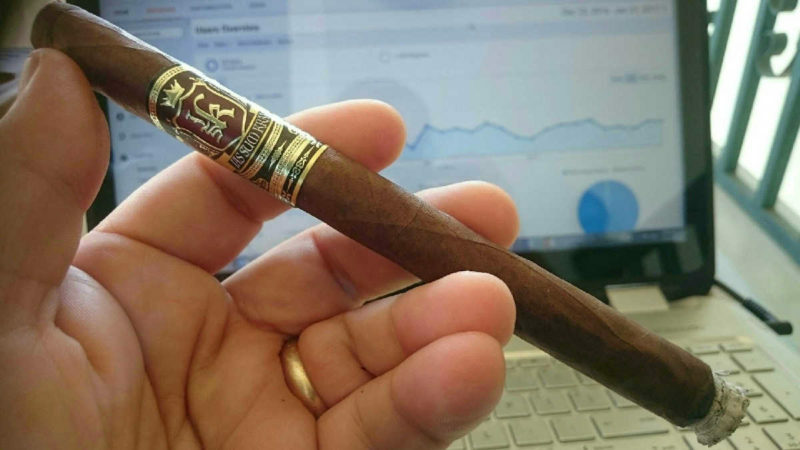 The cigar smokes with a savory, pepper core but shows a sense of suave style throughout. Blended by the brand owner Riste Risteski and Noel Rojas, the cigar was created in Esteli to maintain the “Cuban standard”. Literally translating to “I Am King”, Jas Sum Kral is a Macedonian name for a Nicaraguan cigar with a Cuban soul. Casa de Montecristo is coming to Tampa. My old haunt, Tampa Humidor, is teaming up with the folks at Imperial/Tabacalera USA/JR Cigars to open a Casa de Montecristo lounge in South Tampa. It should be opening in June…which is hopefully about the time I land stateside for a (shorter) visit. I heard a bit of a buzz this week coming out of ProCigar here in Santiago, regarding a new cigar from La Aurora that will feature Andullo (which we’ve spoken of several times here on past shows). It will be called the ADN Dominicano (Dominican DNA), and will carry a Dominican wrapper, Cameroon binder, and four different filler tobaccos – including Andullo. I’ve smoked another cigar with this tobacco (Project 805), and seen it raw in the yagua, but don’t have a great deal of experience with it…yet. I’ve asked a friend of mine to take me to some of his friends’ place where they process andullo. This tobacco is rolled up into large tubular sections for fermentation, and bound by a rope or length of vine to generate some compression. Because it’s compressed during this time, it doesn’t peel apart easily into leaves afterward – so, it’s generally just trimmed off the end and smoked in a pipe. My understanding is this won’t – at least for now – be marketed stateside. It will be available here in RD in four vitolas (5×50, 5.75×54, 6×58, 7×47) if anyone wants to come visit and give ‘em a try. I believe Florida, Pennsylvania, and New Hampshire are the last 3 remaining states that exempt cigars from most/all tobacco taxes. New Hampshire remains so after a bill was defeated to include premium cigars in the existing tax code (which would have added an additional 65% of wholesale to the final price). I can only imagine it will resurface during the next session, though…. In a move I’ve thought about for several years, Hawaii is proposing a ban on mail order/internet tobacco purchases for their residents – only allowing such ordering for licensed retail and wholesale establishments. My guess is many states will watch this closely, as it’s a way to covertly avoid some of the higher tax rates in a lot of states. The ban is, of course, “to protect the children” who might be lured into circumventing age restrictions by ordering through the mail. But, legislators know residents buy online from lesser-taxed states to avoid home state taxation over the counter. Maryland tried a similar but different move several years ago with a requirement that all etailers file/pay their taxes on internet orders. Many etailers simply posted statements that they’d no longer ship to MD, and the public outcry brought that move down. We’ll keep tabs on HI and see how it goes. There has been some activity on the CAA/IPCPR/CRA lawsuit the past couple days, with some motions filed by other entities, although I honestly have not had time to investigate them thoroughly enough to speak intelligently of them. I will post up some info on the forum this week once I have had that chance. Intl. Pipe Smoking Day – Margate ’07 – This blend is evolving and INCREASING in strength to my tastes. I am not enjoying it as much as the other bowls from this jar. Cuba Aliados – My pseudo IPSD celebration. I shall explain. IPSD was Feb 20th – I took the opportunity to dig into some latakia/oriental goodness in Dunhill’s Nightcap and GL Pease’s Abingdon, both aged nicely. This week, I also broke out a 13 year old tin of Marlin Flake. Sweet Mother of all that’s Holy that is some good stuff….